Summer days are made for lazy baking, and there is no better recipe for lazy baking success than cobbler! This gluten free blueberry cobbler is so easy to make, and the more imperfect, the better. 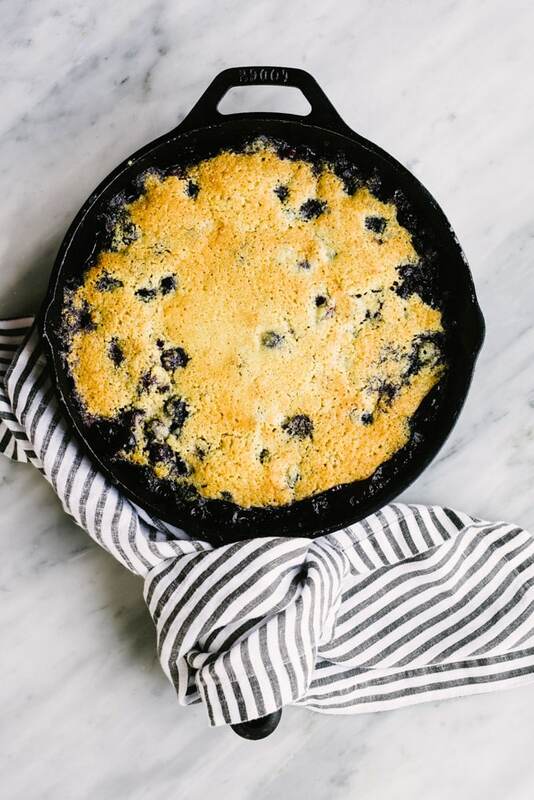 This healthy cobbler recipe is made with a gluten free flour mix spooned over fresh, juicy blueberries then baked in a cast iron skillet. It’s crazy delicious and the perfect summer dessert. These traits all work to my advantage with this gluten free blueberry cobbler. It’s an uncomplicated, sloppier-the-better, summer dessert and it tastes freaking AMAZING. If you’ve jumped on the lazy lady’s pie wagon – AKA fruit galettes – you’ll also love lazy lady cobbler. It’s really, really hard to mess up this recipe, and just like galettes, the more haphazard you are with the crusty bits, the prettier it’s going to look. Pin it now! 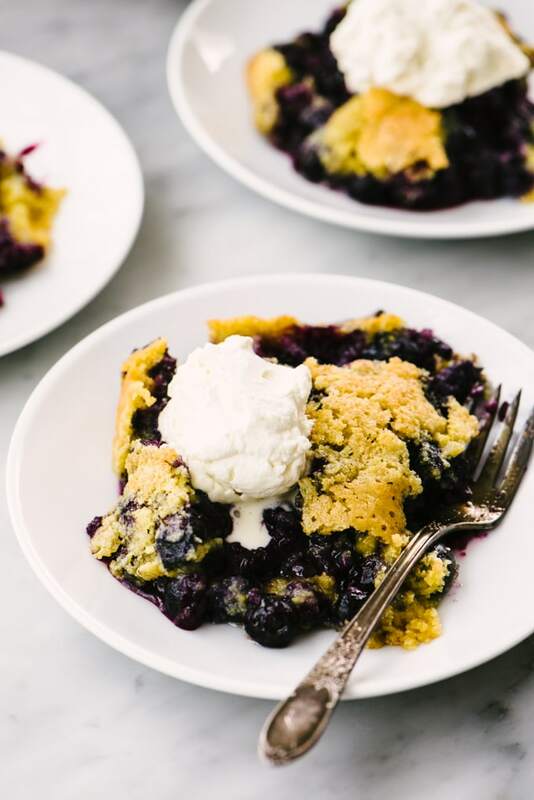 Click here to save this recipe for Gluten Free Blueberry Cobbler to your Summer Recipes board on Pinterest. Not a baker – ding! No dough rolling. No precooked nonsense. No super hard and fast measurements. 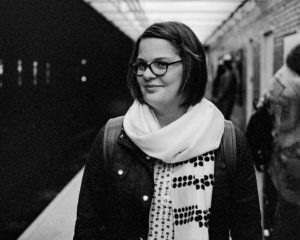 Lazy – winning! Slap some blueberries into a cast iron skillet. Make an insanely easy cobbler topping in the food processor. Haphazardly scoop topping onto blueberries. Bake until bubbly. Healthy…ish – refined sugar free? Check. Lower sugar than the classic? You betcha. Gluten free but still crispy and packed with flavor? Yes. 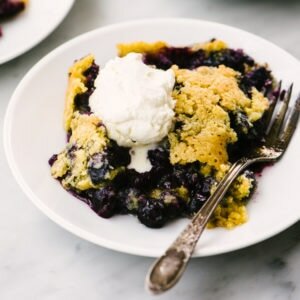 This gluten free blueberry cobbler fits my summer dessert recipe checklist pretty darn perfectly, and I think you’ll fall in love too. I went with a gluten free version for this recipe for many reasons, but mostly because gluten isn’t really my friend and I like a good challenge. I love cobbler, and I wanted a version that retained all of the crisp and crunch of the classic without using weird ingredients or having a cardboard-y flavor (sorry gluten free flour mix, we just weren’t meant to be). I tested quite a few versions of this gluten free cobbler topping to find just the right balance of tender, crispy, crumbly goodness. The winning combo is made with oat flour, course ground cornmeal, and almond flour. It’s nutty and naturally sweet, and bakes up pretty close to the classic version. Classic blueberry cobbler calls for white sugar, but I used a combo of honey and coconut sugar to keep this recipe entirely refined sugar free. Both almond flour and cornmeal are naturally sweet, so I also cut down the sugar to just a third of a cup, and it was perfect. 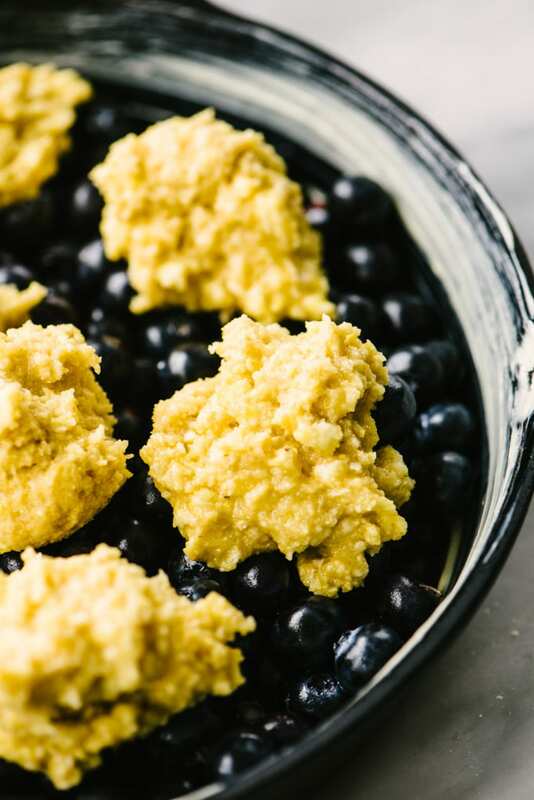 To make the gluten free blueberry cobbler topping, start by placing all of the dry ingredients into the bowl of a food processor and give them a quick blend. 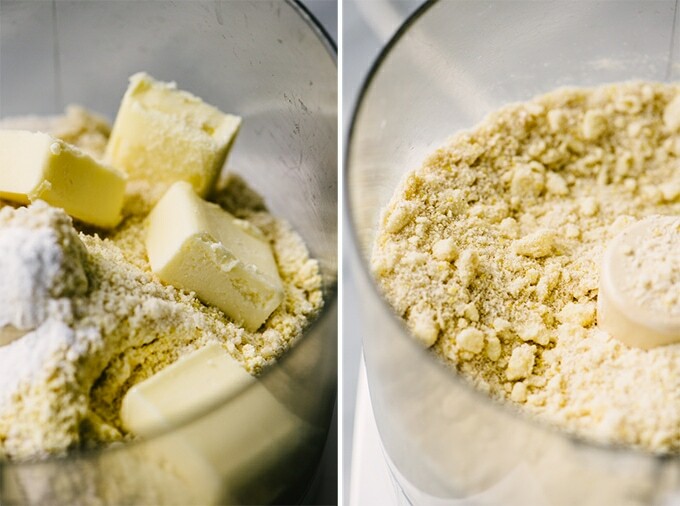 Add a stick of very cold butter cut into cubes to the food processor and pulse 10-15 times until the mixture looks crumbly. Add in a couple of eggs and a dash of vanilla and then pulse again until the batter just barely comes together. It should be sticky and lumpy. Let’s put this beauty together, shall we? Before you make your cobbler topping, toss some blueberries with cornstarch (or arrowroot powder), a bit of honey, and a squeeze of fresh lemon juice. 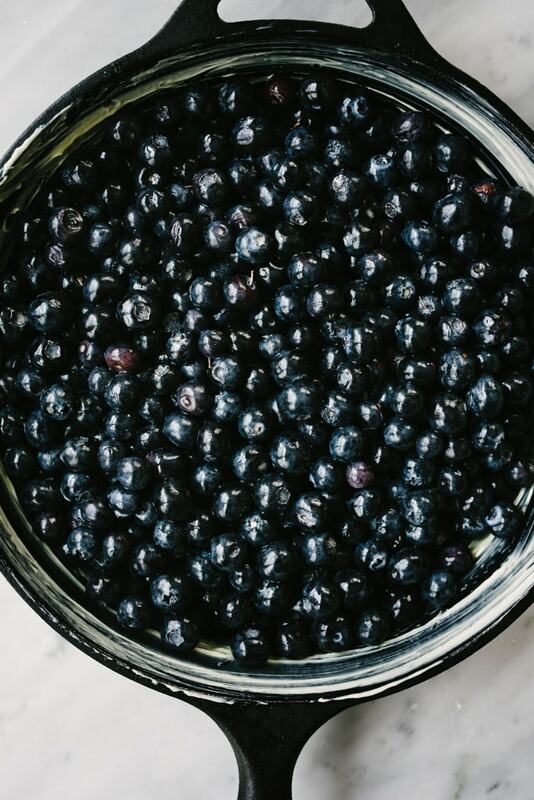 Set them aside to macerate – the lemon juice will break down the blueberries and release some of their natural sugars. Have I mentioned lately how much I love my cast iron skillets? I do. I love them so hard. 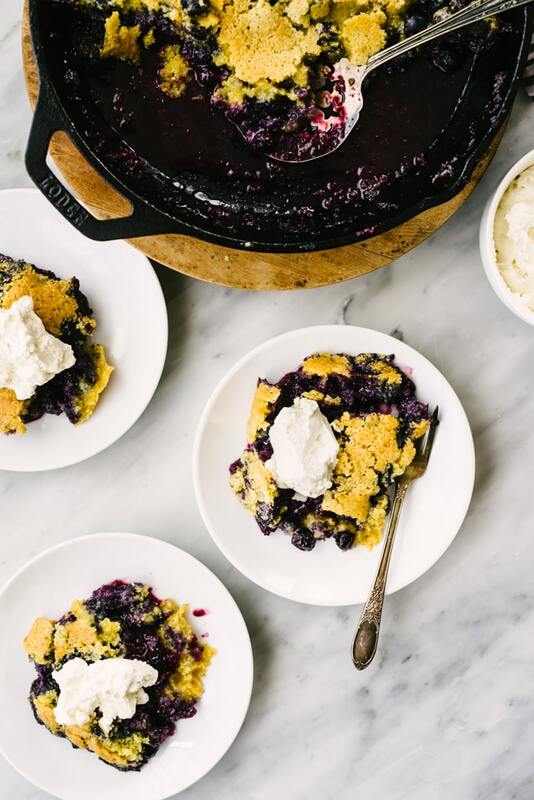 They’re incredibly versatile cooking vessels and there’s hardly a recipe in my repertoire than can’t be made in one – including this blueberry cobbler. Not only are cast iron skillets functional (and allow me to have one less baking dish on hand), but they’re so pretty, and they’ll last (literally) a lifetime – or longer. 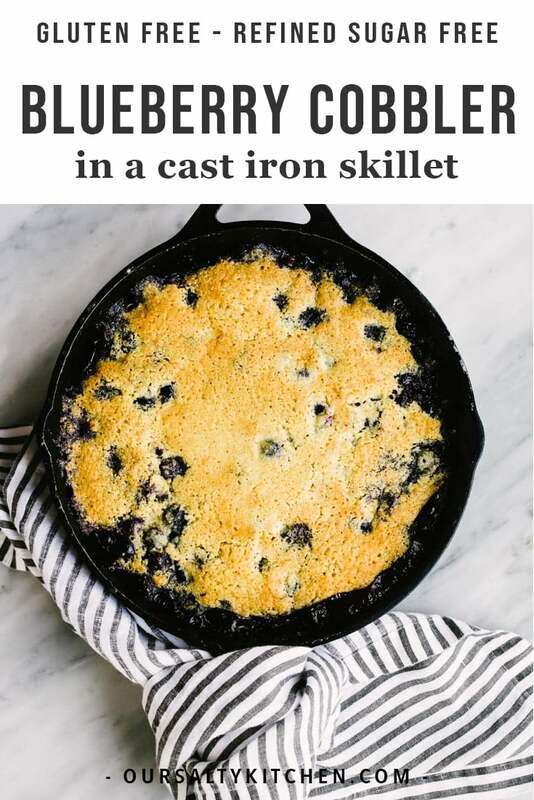 So, grease up a 10″ cast iron skillet with a tablespoon of softened butter and dump your macerated blueberries into it. Top the blueberries with heaping spoonfuls of cobbler topping. Try to space them evenly, but it’s okay if they mush together a bit because the topping will spread as it bakes. Transfer it to the oven and cook until the topping is golden brown. Mine took about 25 minutes. Would you just look at this summer delight? So easy, so delicious. This makes 8 generous portions, or 10 reasonable portions. Slap a scoop of the warm, gooey, cobbler onto a plate, top it with a dollop of homemade whipped cream or ice cream, and dive on in. 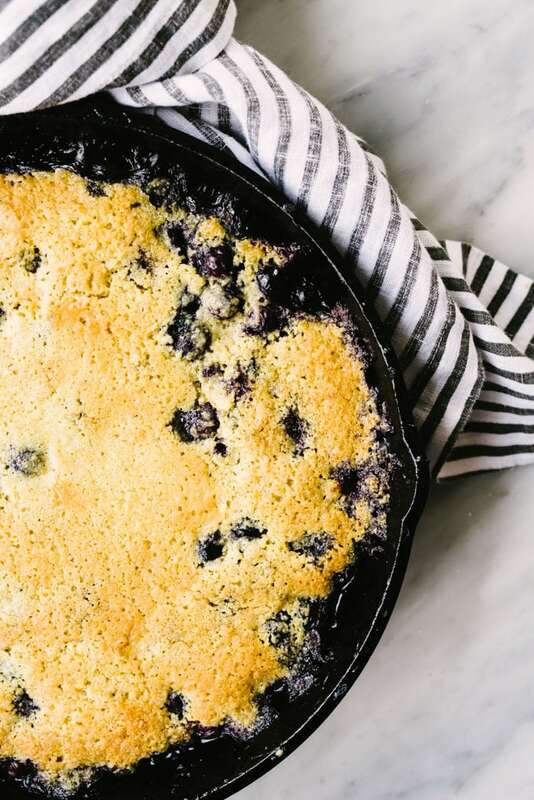 DID YOU MAKE THIS SKILLET BLUEBERRY COBBLER? I WANT TO SEE YOUR CREATIONS! SNAP A PICTURE AND SHARE IT HERE ON PINTEREST. 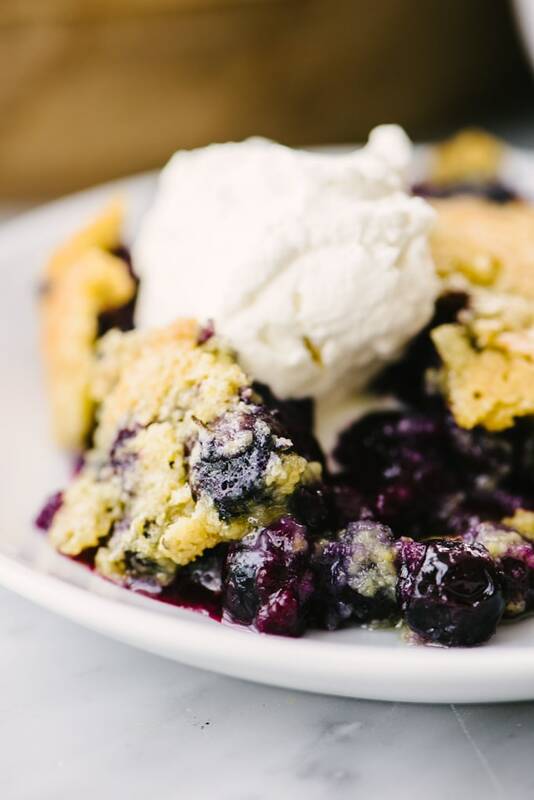 Summer days are made for lazy baking, and there is no easier recipe than blueberry cobbler! This healthy cobbler recipe is gluten free, refined sugar free, and delicious! Heat the oven to 375. Grease a 10" cast iron skillet (or 8" x 8" baking dish) with one tablespoon of butter. Set aside. 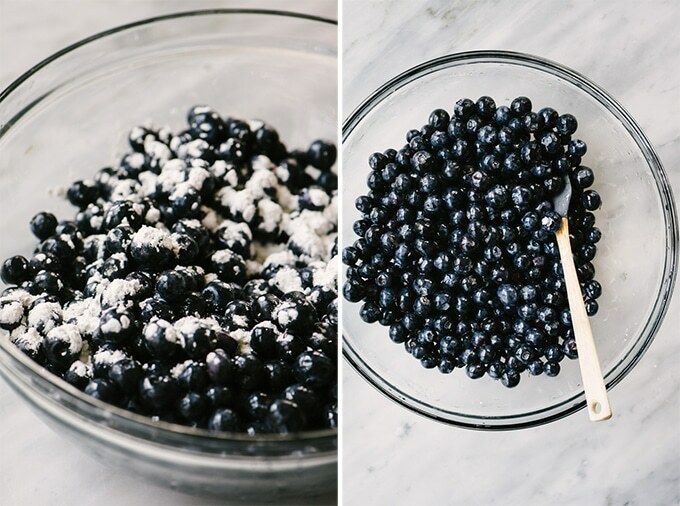 Toss the blueberries with the honey, cornstarch, and lemon juice. Set aside to macerate while you prepare the cobbler topping. 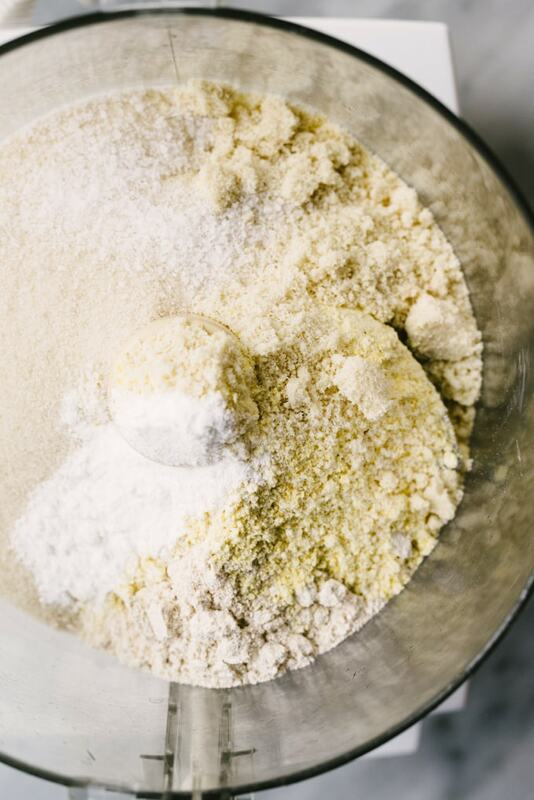 Place the sugar, oat flour, cornmeal, almond flour, baking powder and salt into the bowl of a food processor. Pulse 2-3 times to blend the dry ingredients. Sprinkle the butter cubes into the dry ingredients and pulse, pausing every 4-5 pulses, until the mixture is coarse and and chunky. 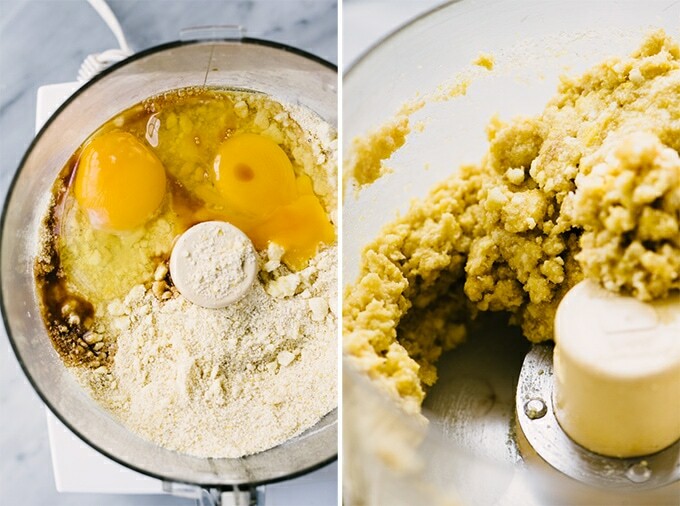 Add the eggs, vanilla extract, and lemon zest and pulse until just barely mixed into the dry ingredients. The batter should be thick and lumpy. Pour the blueberries into the buttered skillet. Spoon the cobbler topping onto the blueberries. Space the heaps evenly, but there is no need to smooth them out. Transfer the skillet to the oven and baked for 25-30 minutes until the topping is golden brown and crispy and the blueberries are bubbling. Remove from the oven and allow rest for 5-10 minutes. Spoon onto plates or into bowls and top with homemade whipped cream or ice cream. Summer dessert dreams come true! I love the coarse cornmeal in this, gives the top great texture! Ooohhh now this is special! I bet the cobbler topping is so good! My family loves seasonal cobblers like this one – especially with a scoop of homemade ice cream on top. Yum! I love cobblers, especially in the summer! This looks so amazing, and that topping looks perfect. This looks great. Love those chunks of butter! I’ve been meaning to get to the blueberry farm before the season is over…now I NEED to! WANT!!! That topping looks like the best texture! Plus I love your cast iron skillet baking method. It always feels so appealing and like home to bake and serve in it. My mouth is watering just looking at those beautiful summer blueberries. Nothing better to showcase them than a cobbler. Golly Moses, this looks tasty! That topping looks like the perfect cobbler texture. I always want more crust than fruit when I eat cobbler. This is truly cobbler perfection! I have a pile of peaches right now though, so I may need to try this out with them until our local huckleberries show up! I’m not a baker. I think I can make this though..and it looks SO good! is now at the top of the list! What a lovely recipe ! So simple, gorgeous, and delicious too ! If you had to measure my love for cooking verses baking, cooking almost always wins. This lazy baking story has some potential to even out the race. Looks so goood, perfect for summer dinners.